Have you ever lined up on defense as a youth football coach and the opponent’s offense lines up with the offense spread sideline to sideline? Your players naturally line up just as you have coached them to. The next thing you know, you look up and your defense is defending things that are never going to happen instead of the one thing that has a 90% chance of happening. FirstDown PlayBook is going to begin installations today that will help youth football defensive coaches out with this problem. We wrote about it on Monday and if you want to read about it check it out right here. You can also watch this video that explains a little more detail about what we will be installing today and tomorrow. 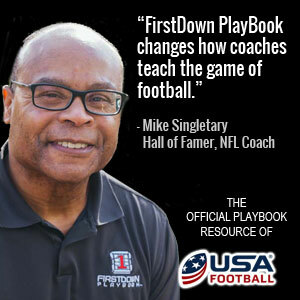 However, if you want to get the full package with coaching points you will want to sign up and become a part of the FirstDown PlayBook football coaching family!